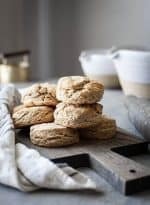 This clean eating Einkorn Biscuits recipe is made with white Einkorn flour. I love them and you will too. Einkorn flour is my favorite flour. You’ve got to try it! Einkorn Biscuits are what I would call realistic bread. Those and Easy 4 Ingredient Spelt Tortillas . Pretty much any other kind of bread doesn’t get made very often around here. Oh, actually I make homemade pizza quite a bit. Not sure if that counts. But any other type of bread is just a little too much work for me to make on a regular basis. In college, my roommate and I would make a bunch of biscuits together and try to make them last a few days. They are so affordable, easy and comforting. Oh, and they are so versatile. They are great as biscuits and gravy, here is my Best Clean Eating Healthy Biscuits and Gravy Recipe. They are also good by themselves, sausage muffin egg sandwiches, with some jam or butter on them, with chicken pot pie soup (I’ll have to post that recipe sometime). They are with pretty much any type of soup because they sop things up really well. Anyway, I probably don’t need to tell you how good biscuits are. But I think you’ll be happy with these Einkorn Biscuits. 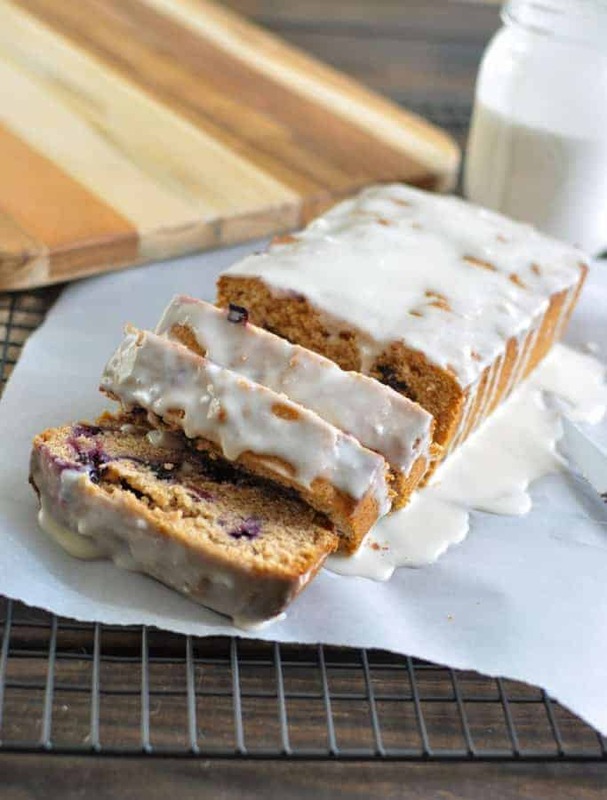 For one thing, they use einkorn flour. I love, love einkorn flour and pretty much use it exclusively for baking at home. I do also use spelt and occasionally whole wheat flour, but I digest einkorn flour the best – and it tastes the best for most foods. It’s so light. You can’t sub it 1:1 with regular white flour though, because if you do, your dough is really, really wet. So I experimented and came up with the perfect Clean biscuits recipe for you. Barely roll out the dough. Make them way thicker than you may think you need to. Trust me. We love them thick and tall. Try to handle them as little as possible. Work them only until they come together. Keep the dough cold. Work fast, and if you need to take a break, throw the dough in the fridge. It’s important to use cold butter. Don’t use melted butter. We like to use a big biscuit cutter or a large cup. If you roll the dough thin and make them small, they are more like hockey pucks. They are really good “free form.” I usually take the last of the dough and just make a biscuit by hand. That’s the one we all fight over. Come to think of it, I should probably just make them all by hand . . . These Clean Eating biscuits are easy, light and fluffy! I make these einkorn biscuits all the time because they go with so many different meals. Place the flour, baking powder, baking soda, and sea salt in a mixing bowl and whisk to combine. Cut the cold butter into the flour mixture until is resembles very coarse crumbs. Make a well in the center of the mixture. Pour the buttermilk into the well and gently mix it into the flour until a craggy dough forms. Place the dough on a floured surface and pat or roll it down until it is about 1 inch thick. Using a round cutter that is about 2 1/2 to 3 inches in diameter, cut circles out of the dough by pressing the cutter straight down and lifting it straight up. Do not twist or it will crimp the dough and cause the biscuits to not rise as well. 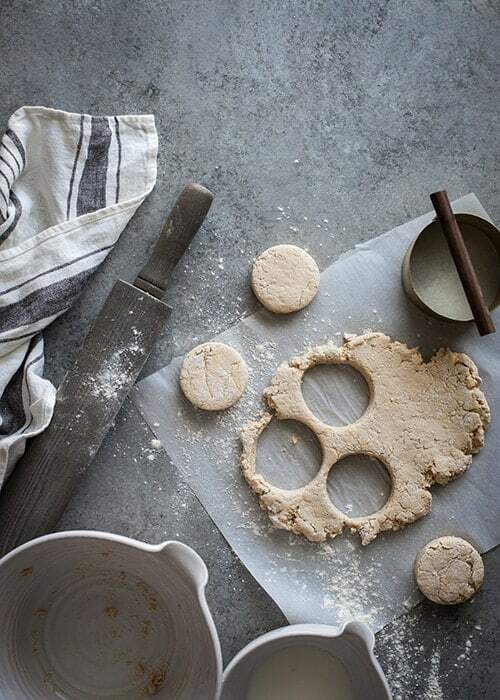 Cut out dough rounds until all of the dough has been used. Place rounds two inches apart on the prepared baking sheet. 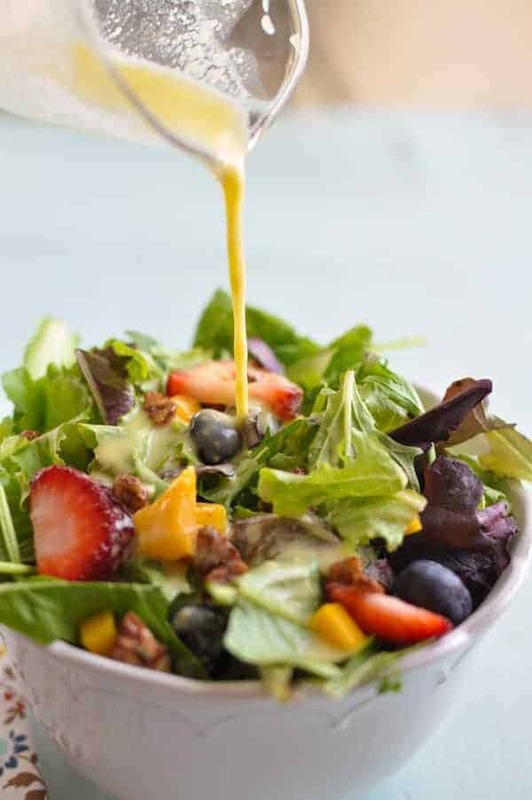 Bake in the preheated oven for 12-15 minutes, or until golden brown on top. Serve with gravy. Store extra biscuits in an airtight container. I’m anxious to try Einkorn flour. You talked me into it. I am so thrilled to find this recipe. I am all about clean eating and being healthy. I have never used Einkorn flour before, but have always wondered about it. Young Living carries it, so I am going to order it on my next order. I’m so excited to try your recipe. I’ve never made my own breakfast sausage either, so I need to try yours. Thanks so much for sharing.